Whether or not you actually have the time or money to visit the shore, simple decorative changes will allow you to walk into your bathroom each morning and feel transported to an oasis of relaxation! A beach theme is common for the bathroom, so it’s important to think creatively to avoid something that’s just run-of-the-mill. 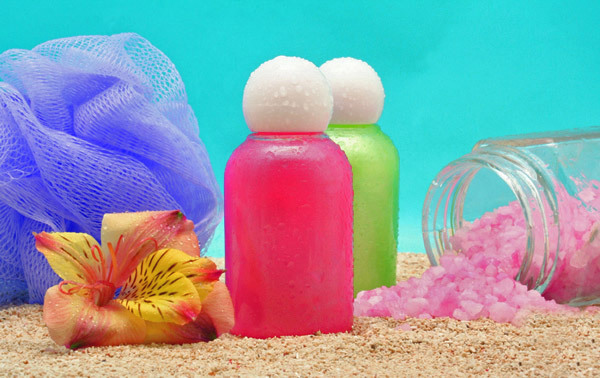 First and foremost, skip the beach decorating kits. Decorating should include a bit of your own personality, and you can’t do that if you are purchasing a one-design-fits-all bathroom scheme. And while you’re at it, skip the palm trees shower curtain and other cliché knickknacks. 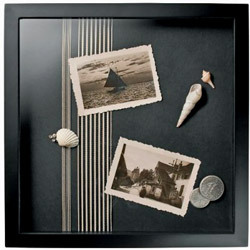 Instead, start with a personal inspirational piece – maybe a photograph from your last vacation to Hawaii, a collection of sea glass, or even mount your favorite yellow polka-dotted bikini in a shadowbox frame (like the one shown to the right). Let this item kick-start your bathroom makeover. Use this inspiration to develop your theme — whether it is Polynesian, nautical or even the Hamptons. Nothing says boring like clinical white walls. To create the right ‘beachy’ vibe, use the natural colors of the seashore. Select a paint in a warm sandy color or a cooler hue such as blue, green or even a purple-grey. The most important thing to remember when selecting a paint color is to make sure you like it. Too often people are more worried about colors matching than whether or not the color makes them feel good. What if you don’t have the time or the money to paint? Since bathrooms are typically small rooms, sometimes all it takes is changing accessories to redecorate. A bright colorful shower curtain and plush terry cloth towels can be inexpensive ways to makeover your bathroom for summer. Stripes suggest classic summer sophistication, and Hawaiian prints add a more festive touch. Get creative and fill a hurricane glass candleholder or clear vase with natural elements like sea glass or shells from a beach trip — or even something along these lines that you find your local craft store. If you are feeling particularly inspired, try gluing shells to a mirror or frame for a unique focal point. >> Create a luxurious spa-style bathroom at home! Looking for the ultimate luxury? For a shoulder-to-shoulder shower spray, replace your shower head with an enveloping rain shower head. You’ll feel as if you are standing under a cascade of tropical rain. And if you close your eyes, you might just believe you are back in Hawaii. >> Get DIY tips, tricks and techniques to make your home better than ever!